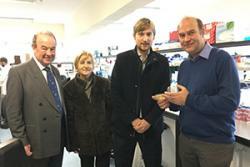 L-r: Nigel Lanceley, Chair NWCRF; Joan Davies, Chair of the Charity's Holywell branch; Lord Mostyn, the Patron and Dr Edgar Hartsuiker during a tour of the cancer research labs at Bangor University.Lord Mostyn has met with leading researchers, scientists and clinicians in North Wales who are pioneering advances in cancer research and treatment. The 31-year-old Lord is an honorary patron of charity North West Cancer Research. His visit comes as the charity announced an increased commitment to funding more than £400,000 worth of cancer research at the Institute over the next two years. During his visit, Lord Mostyn witnessed first-hand some of the research currently being carried out at Bangor, including the use of state of the art microscopy to study tumour samples from cancer patients. He said: “My family and I have been supporting local and national charities ever since the foundation of the estate. It is important that we give something back to the communities of which we are a part. “I am fortunate to be able to invest some time and help to support the fight against cancer. It is a hard reality now that most of us will be affected by cancer at some point in our lives, which is why research is so important. 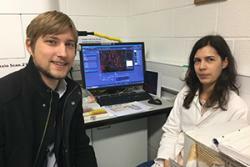 “It was fascinating to tour the cancer research labs here at Bangor and witness first-hand how funding from North West Cancer Research is being used to advance research into this life-changing disease. It really opened my eyes to just how much it costs per day to run a research bench and reinforced the importance of funding and fundraising support. The North West Cancer Research Institute was opened in 2004, with support from the North West Cancer Research Fund, Bangor University and the Welsh Assembly Government. North West Cancer Research is the biggest independent funder of cancer research in North Wales and to date, it has funded around £2.5million worth of research at Bangor University. This includes support for researchers and PhD students, as well as the creation of research fellowships, helping attract some of the world’s leading cancer researchers to Bangor. Nigel Lanceley, chair of North West Cancer Research, said: “We are honoured to welcome Lord Mostyn to the North West Cancer Research Institute at Bangor University. It is great to see he has genuine interest in the research we fund, as well as supporting our fundraising efforts. “We are the largest independent funder of cancer research in North Wales and this is thanks in part to our network of fundraising committees across the country who raise hundreds of thousands of pounds for us every year. We were delighted to be joined by Joan Davies from our Holywell committee, who first introduced Lord Mostyn to the charity.